I’m scooping myself here, for my upcoming March 13 In The Kitchen column for the Princeton Packet about Shepherd’s Pie. Which, by the way, is made with lamb, while Cottage Pie is made with beef. I never knew. But I couldn’t resist sharing this photo of my own recent efforts. I didn’t pipe on the mashed potato topping, but I did use a fork to swirl a pretty pattern on top. The results were delicious; what a shame this dish is relegated to the back of the culinary closet so often. But times are changing, and nice versions are showing up on restaurant menus more frequently, as we crave winter’s comfort foods. 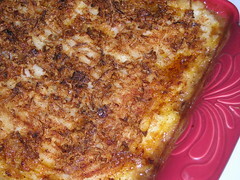 Made with lamb, the dish is a lot more interesting than just another hamburger casserole. Seems like shepherd’s pie is everywhere lately. Once I’d started working on my article for the Packet, I saw the New York Times Magazine featured meat pies, and a delicious looking dish of lamb and eggplant shepherd’s pie is on the cover of this month’s Bon Appétit magazine.